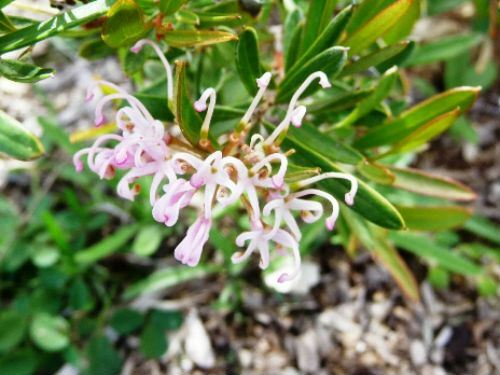 Grevillea humilis is an erect to spreading shrub that may reach a height of just over one metre. The species is said have rhizomes and thus sucker. In our cold climate garden our specimen has shown no signs of suckering. The leaves are oblong to elliptic, up to five centimetres long with turned down margins. Flowers are carried on the ends of branches and may be white or pink. Peak flowering occurs in spring and summer with sporadic flowering at other times. In Volume 2 of The Grevillea Book by Olde and Marriott the species is described as the coastal form of Grevillea linearifolia. Our plant certainly is similar in appearance to G. linariifolia. There are three sub species. There is also a prostrate form marketed as ‘Coastal Gem’. Light, occasional pruning will prevent plants becoming straggly. Grevillea humilis could be grown as a foreground plant in native garden beds and also the species would be a useful addition to rockeries and cottage gardens. The species is found on the Central Coast and North Coast in NSW as well as southern Queensland. Grevillea humilis propagates readily from cuttings.